When talking to people about lean (or continuous improvement, operational excellence…), it’s possible waste hunting (or the 7+1 wastes) comes up. But I’ve noticed that Muri and Mura are being a lot less discussed, even though these 2 terms are much more important than Muda. As a lean coach, one of the first things I learned were the 7+1 wastes. On my first day, I was eager to start hunting for “Tim Woods” on the shop floor, so I started taking down everything I saw. Waste started popping up everywhere: inventory was stacking up near the production line, operators had to walk far to get parts, or were waiting too long for parts to arrive, a lot of checklists needed to be filled in… Afterwards we got together with the team to build an action plan so we could try to improve these things. We were not aware of the fact that we were walking straight into the Muda trap. Muri, Mura & Muda are Japanese words and key concepts known in the Toyota Production System (TPS) as one of the three types of waste. Toyota adopted these three Japanese words as part of their product improvement program, due to their familiarity in common usage. This category focuses on safety & stress. Everything hindering a safe and stress-free environment can be seen as Muri. Stress can take the form of physical (overburden of people or machines) or mental stress (frustrations). Mura refers to the unevenness in an operation, or an uneven work pace, causing operators to hurry and then wait. If the actual duration of an activity deviates from the theoretical one, this is most likely caused by some kind of Mura. The third category is related to any activity that consumes resources without creating value for the customer (= 7+1 wastes). And the effect of non-ergonomic or stressful environments can sometimes only be visible after several years. The same is true for Mura: unevenness is often hidden (low frequency and/or easy to overlook) as you need the necessary know-how to see it. A good example is the battery of certain tools that needs to be replaced: chances are low that you will see this happen during a Gemba visit, but it’s important to take this waste into account when optimizing a process. It can take some time to remove the battery, walk to the place where batteries are stored, etc. Also, tackling Muda will offer more short-term results (as you will reduce the non-added value operations), making it more attractive to deal with first. As a result, the focus of improvements following this process will be more on Muda than Muri & Mura. This means that Muda will be reduced, but the process is still going to include overburdening and unevenness. What’s even more striking is that, even though the process is going to be more efficient, it’ll be more stressful and unbalanced than before. Let’s take ‘waiting time’ or ‘inventory’ for example: these 2 types of waste can create some “slack” on the process. In reality, these wastes are used to recover from non-ergonomic situations (i.e. working above the head, bending over, sitting on the knees…) or from unevenness (i.e. changing the battery). If you take away the slack without removing Muri & Mura, you can increase the level of stress experienced by the operator. This will create a process that is not sustainable, also called “the Muda trap”. Map all observations in the 3 categories Muri, Mura & Muda (see picture below). Next, look at which Muri & Mura you can tackle, before going to the Muda category. After using the tool mentioned above for a couple of years, I noticed a change in mindset when observing all kinds of processes: first, try to find the things that could make the process unsafe or overburden people or machines (Muri), then the things that could create unevenness (Mura) and last, but certainly not least, look at the 7+1 wastes. It’s important to use a good improvement tool like this 3M-analysis, but focus on them only within the context of enabling a system to better drive ideal, principle-based behaviors. The great thing is that this is applicable to every process in every field (Society sector, Healthcare, or even at your own house!). Countering the Muda trap by tackling Muri, Mura and Muda (in that order), can deliver extraordinary benefits with regards to how you improve a process. That’s exactly what I experienced after my first encounter with the Muda trap as a lean coach. 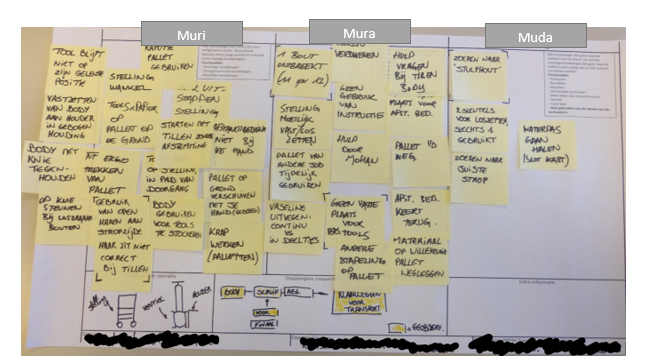 From the moment I started to focus on Muri & Mura, the people really felt that their work became easier, less stressful and more streamlined (less variation) than ever before. This made it easier to start a new improvement exercise within the team, thus facilitating a culture of continuous improvement! Now I’d like to hear your experiences on this topic. Have you ever fallen in this Muda trap? Do you have other methods to counter this? Is this applicable to your field of expertise? Let me know in the comments below!